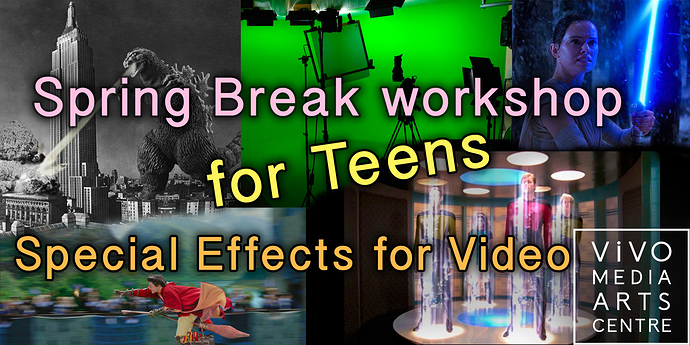 A Spring Break workshop for teens: learn to create mind-bending special effects for video with artist Flick Harrison! Promo code vivosfx applies a 20% discount off any ticket, until Feb 20! Groups of 3 or more get 35% off each ticket! That’s only $107 per participants for 16 hours of instruction, all equipment included. And as already mentioned, there’s a promo code vivosfx applies a 20% discount off any ticket, until Feb 20! This teen workshop is now BY DONATION – pay what you can. Please spread the word. It appears that too many people cannot afford to participate at the current registration fee. As you know may know, VIVO’s a non-profit . Our challenge is to keep workshop fees as low as possible for participants, while still paying our rent, maintaining facilities and equipment, and striving to compensate instructors fairly. Registration fees contribute help us cover costs. We suggest donating $80 for this 16 hour workshop. However, we are here to serve participants, so pay what you can. Anything at all is appreciated. I hope you can make it! Please tell your friends about this unique workshop!